Today our guest blogger, David Toland, discusses how the recent county health rankings released by the Robert Wood Johnson Foundation affects Southeast Kansas. You can find out how your county ranks by visiting the Kansas Health Institute. David is the Executive Director for Thrive Allen County, a nonprofit in Southeast Kanasas that provides a new model of rural revitalization that works to harness the strengths of residents in building healthier communities. 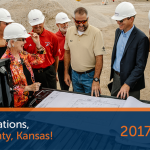 The release of this year’s county health rankings has been closely watched here in Southeast Kansas. Our region of Kansas is the oldest, sickest and poorest section of the state, and has been for generations. When the first county health rankings came out for Kansas in 2009, it was a big deal. Many of us in the health field were elated to finally be able to easily quantify to the “man on the street” how bad health conditions are here. Others were not so thrilled. The rankings were terrible, and many people were embarrassed. Seven of the nine counties in the southeast corner of the state were in the bottom 10 in the state. The county where I live—Allen County—was ranked 94th of 105 counties. We joke that the bad news is that we’re #94 out of 105. The good news is that we have the second best ranking in the region! The beauty of the rankings—love them or hate them—is that anyone can understand them. To be blunt, the rankings have been a tool to use to mobilize and unify a region that has been divided by years of infighting. The common refrain has been that “we knew it was bad, but not THIS bad.” And when something is “THIS” bad, something has to be done. This awareness spurred action. A regional health initiative started in 2010 morphed into a broader quality of life effort called Project 17. Project 17’s aim is to improve health and economic conditions across 17 counties of Southeast Kansas, using tools like the county health rankings as mechanisms to bring people together around common quality of life goals. For the first time in Southeast Kansas we’re seeing that health isn’t an issue that only “health-types” care about. Thanks to the county health rankings there’s a broader awareness of the importance of healthy lifestyles and access to healthcare among business and political leaders, in particular. In our region, this is remarkable. And amazingly, everyday people know how their county is ranked, and they bring it up in conversation. Folks are starting to get it. In Allen County, we’ve set an ambitious community goal: to improve our ranking to #85 by 2015. Can we get there? Perhaps. We’ve improved slightly over last year, and a number of initiatives the Thrive Allen County coalition has pushed will begin to bear fruit over the coming years, including a new critical access hospital, a safety net dental clinic and the recruitment of doctors and dentists to our rural county. But it takes time. If we don’t make it to #85 in that timeframe, it’ll be OK….as long as we’re making progress. After years of decline, just slowing the downward trend is an accomplishment, as is the unity of purpose our region is beginning to develop through Project 17. We have a long way to go in Southeast Kansas, and there’s no clear road map on how to get there. But thanks to the county health rankings, at least we know where we’re starting.